We are presented with the strange spectacle of Julian Assange seeking and receiving asylum in the Ecuadorian Embassy in London. Is it out of fear of Swedish justice or out of desire for publicity? 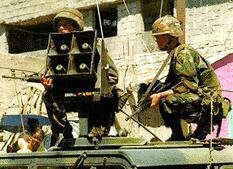 In 1989, the US invaded Panama. Five days later, Panama’s deposed leader General Manuel Noriega sought asylum in the Vatican’s embassy in Panama City. He spent his time in a room without AC or TV, reading the Bible. US troops established a perimeter and blasted loud rock music. After 10 days, Noriega left the embassy and was arrested. A wholly different case concerned Cardinal Midszenty of Hungary. A victim of Stalinist repression, he was freed in 1956 by the Hungarian Revolution. After the Soviet Union invaded Hungary to re-establish communism, Midszenty, fearing for his life, asked for asylum in the US Embassy in Budapest. He spent 15 years there before being allowed to leave for Austria. On December 14, 1825, in St. Petersburg, what came to be known as the Decembrist uprising was crashed. Prince Trubetskoy, who was to be the leader of the troops challenging the authority of the newly crowned Nicolas the First, had a panic attack and proved unable to join the men. Instead, he wondered the street of St. Petersburg for hours before seeking refuge at the house of the Austrian ambassador, who also happened to be his brother-in-law. He was arrested the next day.